leading supplier of allergenic extracts, ana-kit, allergex, quintest and other products to allergy clinics across north america. Sells plant plugs, trays, and mini greenhouses. Page includes photos of products. Located in Hollister, CA, USA. Products for ostomy, wound care, incontinence and continence care, breastfeeding, patient identification, medical records, obstetrics, and cold therapy. Sales of suri and huacaya alpacas, offering farm tours, stud service, and boarding. Also selling alpaca & llama fiber, hand-spun yarn, and custom garments in Hollister. Janice Chiaffredo Appraisal Service is a full service residential real estate appraisal firm located in Hollister, California. Information on the Happy Hollister 33 book series, its publisher and writers. Books are also available for sale. Competitive U9 girls soccer team members of the Hollister Tremors Soccer club in Hollister, California. Recreational and competitive youth soccer club for ages 4-17. Site contains club news, field locations and coaches page. Located in Hollister, California. Hunting lodge near Hollister California. Obstetrical and family practice service in Hollister. Producing hunting dogs. Stories, litter announcements, and photographs. Hollister, California. Includes sales list, photos, and profiles of foals. Located in Hollister. Based in Hollister. Providing tandem and accelerated free fall classes. Includes sales list, photos, and profiles of horses. Located in Hollister. Standing chestnut, palomino, bay stallions at stud. Includes sales list, photos, and profiles of horses. Contains articles and blog. Located in Hollister. Standing gray stallion at stud. Includes photos and profiles of stallion. Located in Hollister, California. Standing dun and grullo stallions at stud. Includes sales list, photos, and profiles of horses. Located in Hollister, California, United States. Produces wines from Italian varieties, Cabernet, Merlot, and Zinfandel in Hollister. Includes product descriptions, online purchasing, and a company history and overview. Also makes olive oil. Black Polish and Crabbett Arabians at stud and for sale. In Hollister. Boozefighters M/C Chapter 18, carrying on the tradition in Washington, DC as our brothers did in Hollister. Hang gliding instruction as well as a complete hang gliding sales and service facility in Milpitas, Northern California, U.S.A., just south of the San Jose / San Francisco Bay Area. Training site near Hollister. Complete sales & service facility. Owner Pat Denevan. Offers design, website management, logo, and hosting services. Based in Hollister, California, United States. Hollister Free Lance - general information on local mazes. Medium. Readings and events, FAQs, brief book reviews, and contact details. Family history compiled by John Joshua Jenkins. Includes family tree (available for download) and photographs. A local meditation center serving the Gilroy, Hollister & Morgan Hill region, for those people having a sincere interest in learning, exploring, understanding & living Buddhism & dharma. Non-sectarian, vipassana, mindfulness, Shambhala. meet the characters and learn about the old book series. Biography, news, and multimedia files of the rhythm and blues artist. Lists meeting dates, news and activities, members gallery, and links to some other clubs and events in California. SiteBook Hollister City Portrait of Hollister in California. 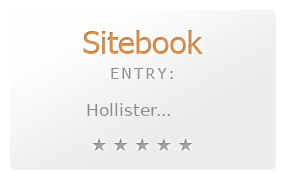 This Topic site Hollister got a rating of 3 SiteBook.org Points according to the views of this profile site.